Start of the story about child of Amazon employee is here. Seattle weather gives up. Spring came and I can stay all the day because there is no cold anymore. Starting at earlier morning. City is waking up. Looking forward to see more people at lunch time. I have a business idea: to ask $1 from every guy who makes photo of my banner at the street. No kitting, in 1 month I could become a millionaire. Now I know the goal of Blue Origin. We want to leave our planet to our children. 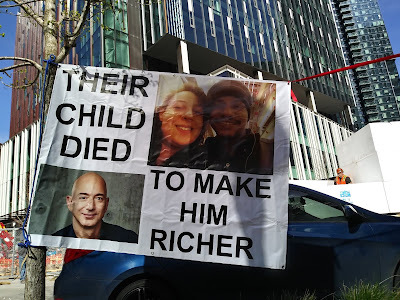 Jeff Bezos doesn't care about our children. He doesn't care about the planet. He wants to build Blue Origin rocket and fly away to Mars. The question is why Jeff Bezos would want to fly to Mars? The answer is simple. Just because to many people don't like him at the Earth. It is not easy to say, but I am an idiot. During the whole month, I grabbed heavy metal tripod and straight bars to make installation of the banner. Instead I could just tie it at the tree on the street with a rope. Sometimes obvious ways are not visible from the small distance. 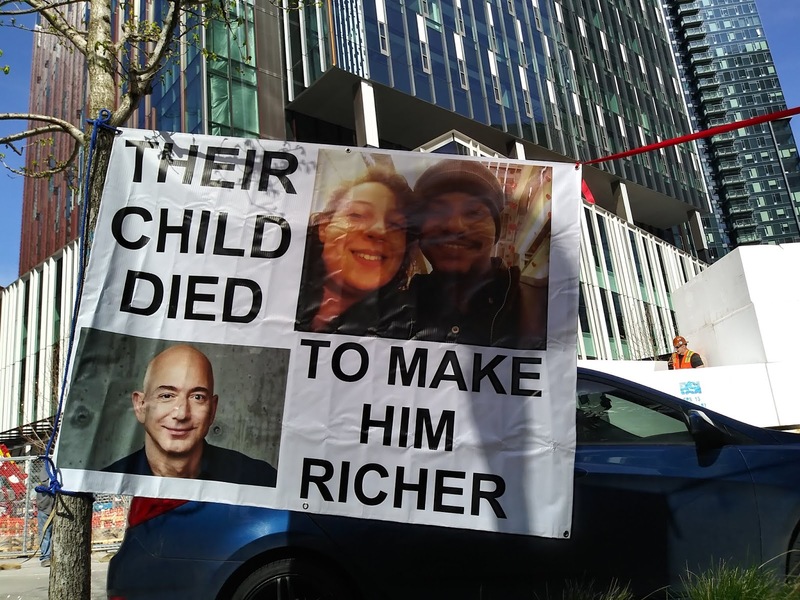 In the same way obvious fact "the life is not worth to get rid of it making Jeff Bezos richer" is not visible to many Amazon employees while they work. Do you know the real reason why Amazon does not react to such horrible stories when children die? Surprise surprise! It is written in Amazon policy. Say you complain to HR about crime at Amazon. The first reaction of HR to your complaint is: Have Backbone; Disagree and Commit. Leaders are obligated to respectfully challenge decisions when they disagree, even when doing so is uncomfortable or exhausting. Leaders have conviction and are tenacious. They do not compromise for the sake of social cohesion. I believe even Adolf Hitler would react to such complaint even if child would be Jewish. Today I last half a working day there (4 hours or more). I believe these hours compensate my missed days in the beginning of the week. Respect to Amazon security today: unlike in NY, they didn't prohibit me to use restroom of Starbucks and grab coffee there. Btw Starbucks doesn't belong to Amazon yet. Otherwise, I could not sustain more than 1 hour protesting without coffee. Seattle is a hometown of Starbucks and hometown of American coffee. Maybe that's why it is illegal in Seattle to prevent people from entering Starbucks? Anyway, not paid for advertising, I declare under penalty of perjury: Starbucks coffee is the best. And their restrooms are the best also.